可算名詞 枢機卿(きよう) 《ローマ教皇 (Pope) の最高顧問で新教皇を互選する; 緋の衣と緋の帽子を着ける; 称号としても用いる》. From French cardinal, from Latin cardinālis (“pertaining to a hinge, hence applied to that on which something turns または depends, important, principal, chief”), from cardō (“hinge”) + -ālis, adjectival suffix. Of fundamental importance; crucial, pivotal. (nautical) Of or relating to the cardinal directions (north, south, east かつ west). Describing a "natural" number used to indicate quantity (e.g., one, two, three), as opposed to an ordinal number indicating relative position. 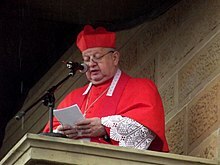 Having a bright red color (from the color of a Catholic cardinal's cassock). His uncle, a Cardinal, engages a Spanish youth of Moorish descent called Diego, an expert singer and player on the virginal, to unlock the secrets of the heart, […] and cure him by the spell of his music. Any of a genus of songbirds of the finch family, Cardinalis. Any of various related passerine birds of the family Cardinalidae (See Wikipedia article on cardinals) and other similar birds that were once considered to be related. The cardinal red and silver grey colors were worn with great enthusiasm. In the spring-time, when the entire student body bought their new straw hats, the bands were of cardinal and grey ribbon. This cardinal number is the smallest of the infinite cardinal numbers; it is the one to which Cantor has appropriated the Hebrew aleph with the suffix 0, to distinguish it from larger infinite cardinals. Thus the name of the smallest of infinite cardinals is 0א. (grammar) Short for cardinal numeral, a word used to represent a cardinal number. The commonest numerals in Latin, as in English, are the "cardinals" […] and the "ordinals" […]. Short for cardinal flower (Lobelia cardinalis), a flowering plant. The sweet-briar rose with perfume good, / And the violet grows in the Milton wood, / The cardinal red—a queen is she, / But the sweetest flower is Mary Lee. Short for cardinal tetra (Paracheirodon axelrodi), a freshwater fish. (historical) A woman's short cloak with a hood, originally made of scarlet cloth. […] ; and whilst she was looking over several pieces of each, she took an opportunity of concealing under her cardinal a piece of cotton, and several handkerchiefs, with which she went off undiscovered; […]. ^ Press Office (17 Feb. 2014), “The College of Cardinals General Documentazion”, in The Holy See .